Ladies who want to learn stitching, embroidery and knitting find it difficult to get the designs. This album of designs is made with the idea of helping, encouraging and giving correct guidance to interested persons. 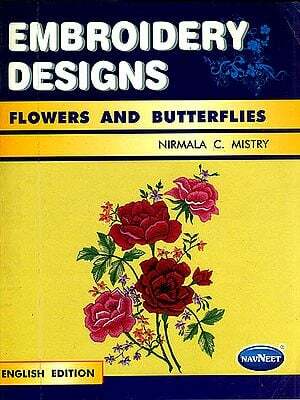 In this book of “Embroidery Designs”, the way how to embroider different stitches is explained with the help of designs and explanations. Along with it, transferring the designs on the fabric by different methods is also explained. Apart from that, colour design plates of different stitches are also given. These coloured plates give a clear idea as to how to embroider a particular stitch and seeing how it looks. In this album of “Embroidery Designs”, almost all stitches are shown by different needlework designs. Housewives can make use of these designs even at home. They will also learn embroidery by making use of this book of designs with great interest. Those who are going to appear in the embroidery examination can also make use of these designs for preparing various samples. I am very much thankful to Smt. Bhairvibahen A. Gala for useful guidance to make this “Embroidery Designs” album popular. I am also indebted to the artist Shrinivas Safar in the completion of this book. I am thankful to Shri Shantibhai Gala and Publishers to encourage my art and also in writing the text of this book.